Each of our Textured Vertical Blinds are designed with a self-aligning aluminum headrail and come standard with a dust cover valance. Perfect for larger window applications such as sliding glass doors. 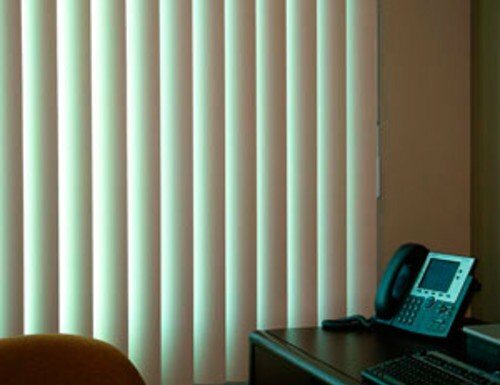 Find vertical blinds for sale in various colors listed below. I have a picture window 110" wide. Do you have a verticle blind that will open from the middle and go right on the right side, and, left on the left side evenly? Most of our vertical blinds offer a "split draw" option to open and close from the center. Simply contact customer server to request this feature. Do you have 2" vaned vinyl vertical blinds? Currently, all of our vertical vanes are 3 1/2"
But we do carry 2" horizontal products such as faux woods and real woods. Very nice product. Very heavy and texture not real heavy. Perfect fit and look beautiful . Perfect fit and look beautiful . Glad I went custom and not store bought. Everything was fine with this order, except one blind had a hole in it, I contacted Blinds Chalet, and they just requested a photo of the blind. They are just what I wanted and expected. They are just what I wanted and expected. But the instruction for installation could have been a little more clear and explain a little about doing things in advance.